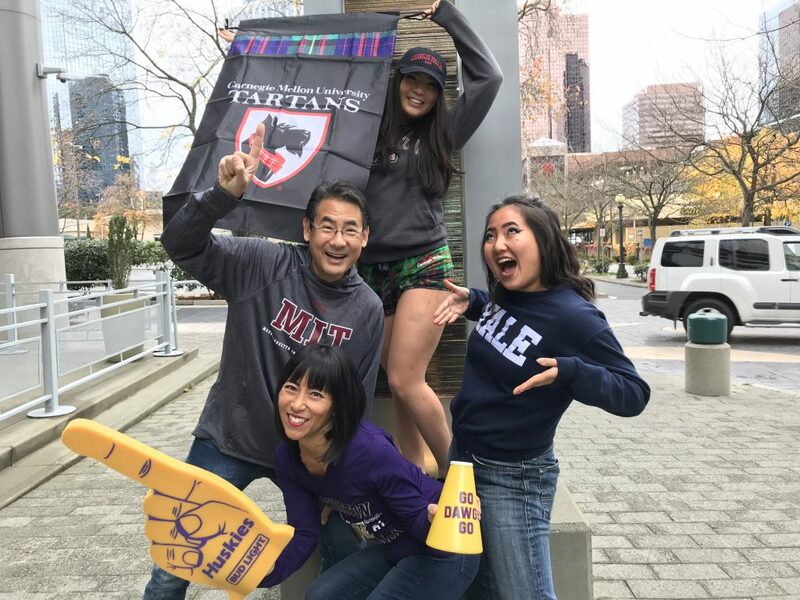 Annalisa Pao (CMU 2022), Stephen Pao (MIT 1989), Christina Pao (Yale 2020), and Marsha Pao (UW 1989) in their college gear! After a hiatus, the Pao Family Holiday Video is back for 2018, this time with a different video podcast format! Check it out! ‘Tis the year of many changes! Annalisa is officially a college student which means Stephen and Marsha are officially “Empty Nesters!” With this new status, a move to Portland, OR, happened along with a 28 day stay at a German fasting clinic! Stephen and Marsha: Marsha’s 20 year stay-at-home career has largely ramped down with only occasional furrowed brow and side-eye needed. Stephen took Marsha’s lead and ramped down his duties at Igneous into temporary retirement/consulting. Having a “buddy” throughout the day especially for those all important Happy Hours has been awesome! Christina: Now a junior at Yale! But more importantly, on December 25th she can buy her own alcohol rather than tapping her parents dry. Okay, she was also busy in Germany (6 wks) and Japan (7 wks) this past summer completing research on immigration, and she got published!!! Annalisa: A freshman at Carnegie Mellon’s School of Design is enjoying Pittsburgh. Ask in February how she enjoys Pittsburgh, and let’s see if the answer is still the same! Joined club water polo but really all her time is spent in the studio! Her last high school hurrah was placing first in the Naramore Photography competition and being recognized at the Seattle Art Museum!!! We hope this message finds you doing well! Please let us know how you are doing! Same contact information, just a new physical address! Come visit Portland!!! Oh, and by the way, please check out some family blogs! Marsha is starting bykumi.com that will cover food, health, and life! And Stephen has been writing on time-restricted.com as well!